Participatory Performance. Background Sound Thunder and Lighting. The Piano is a powerful instrument of sound to convey the message of Sacrifice I wish to convey to the Universe. The Sounds of its Destruction gives full voice to Sacrifice: To the Destruction Creation in it cycle of Creation is giving us time to understand the preciousness of Mortal Life that it never be given up to or for Sacrifice of any kind… If we must have WAR send our PIANOS to WAR. If we must have VIOLENCE send our PIANOS to VIOLENCE, I dare YOU to HATE your PIANO to fill it with your HATE and BIGOTRY and Let Creation Know your PIANO’S Life does not compare to the Miracle of Life WE MORTALS are and that OUR PIANO is the SACRIFICE TO THAT FACT…As for the Egg and the Feathers they are the subtle aspect the preparation for the SPIRITUL BONDING with the PIANO: The Egg when it is held gently in one’s cupped hands and You imagine the worst aspects of Your Character and then crush the Egg on the PIANO you have committed Yourself to the surrender of those worst aspects to the Sacrifice the PIANO is… The Feathers placed on top of the crushed Egg are the signal to the Angels to carry the Sacrifice to a place of Spiritual Redemption. 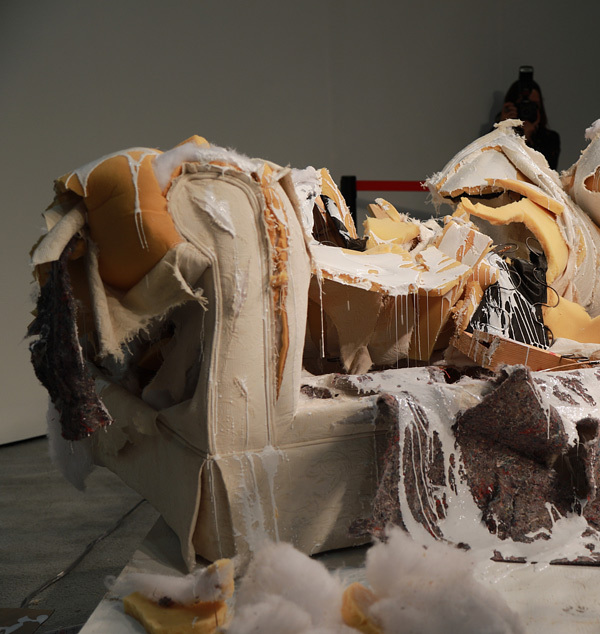 An Upholstered Couch sits with a digital projection of a Guardian Angel onto the Couch, held there by the Auric Energy of the family that relaxed in the Couch for many years. Trapped by the Guardian Angel’s devotion to the family’s Auric Energy absorbed in the stuffing of the furniture, the Guardian Angel can only be released from the Couch by a Destruction. 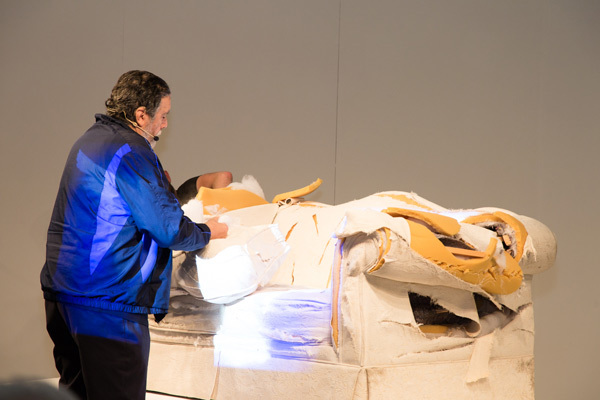 The performance begins by the creation of a Salt Circle around the Circular Arena within which the Couch will be destroyed to release the Angel. 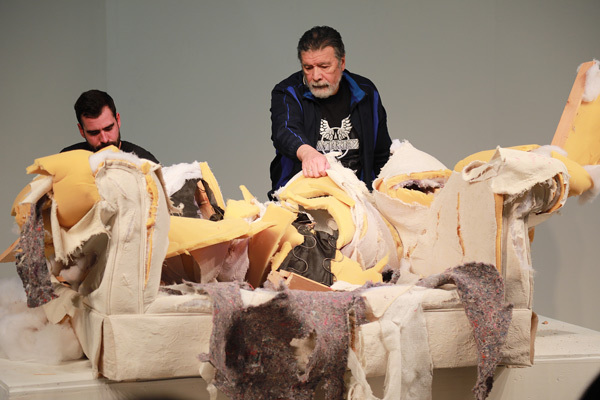 Persons in the Audience participate in the Freeing of the Guardian Angel Couch. course you can look at the SHREDDER like it’s an appropriated or found object. You can listen to it SHRED as if it were a John Cage Concert. Or you can participatefeeling insecure and vulnerable. These are times that make one weary, even afraid… But staying afraid, staying weary is not the Answer… Start by taking a sheet of paper and writing: I WILL STOP BEING AFRAID / I WILL STOP BEING WEARY / I WILL SHRED MY FEAR / The Shredder serves us, it protects us. When we shred something it releases us from I WILL SHRED MY WEARINESS… INSERT the sheet in the SHREDDER. LISTEN TO THE FEAR AND WEARINESS SHRED AWAY. Active as an artist since the mid-1950s, Raphael Montañez Ortiz has produced a body of work that spans seven decades and a similar number of distinct modes and forms: painting, recycled films, sculpture, music, installation, guerrilla theater, performance, and computer art. His work resides in major permanent collections, including New York’s Museum of Modern Art and Whitney Museum of American Art, London’s Tate, and the Smithsonian American Art Museum in Washington, DC. It was collected early on by arts patron Dominique de Menil and Dada cofounder Richard Huelsenbeck; and Ortiz’s performance inspired Arthur Janov’s primal therapy, known for its use of the “primal scream” in therapy sessions and for John Lennon and Yoko Ono as early adopters. In 1969 he founded the first Latino art museum, El Museo del Barrio.